Bot Camp is an affordable, best-in-class robotics program founded by FIRST Robotics World Champion and high school robotics teacher Shawn Lim. Our flagship program is a week-long robotics day camp for students 10-14 years. Structured in a similar way to a sports camp, except students build robots that play sports. Take an 80-minute robotics workshop at our Yonge and Sheppard robotics lab located above Whole Foods. We offer 15 different workshops covering a variety of topics, challenges and skill levels. Drop by and try one today! Serious about robotics? Bot Camp invites our top students to join our official VEX IQ teams in a full-year elite-level competitive robotics program. As in so many camps, the real value of the programming comes from the people that campers meet when they attend, and that’s especially true in this instance. At Bot Camp they’ll work with peers who share their passions and aptitude for STEM. They’ll also enter an environment of champions; all of the instructors are award-winning, competitive robotics athletes. And they think of it in that way—it’s a sport, and they approach it as you would any sport, with drive, passion, and a thirst for challenge. The program is designed, developed, and run by Shawn Lim, who is himself an elite athlete in the world of robotics and programming. As director of district implementation for FIRST (For Inspiration and Recognition of Science and Technology) Robotics Canada, he has a deep experience and history with competition, having competed in the very first event in 1998. He’s vibrant, and inspiring, and runs the programs in that vein. The camp is committed to providing girls opportunities, with ample gender peers and mentors. "The Most Fun He Has Had In A Long Time"
Just a quick note to say thank you so much to the Bot Camp team for providing such a great program for my 10 year old son. His week at Bot Camp was the most fun that he has had in a long time, and we have tried a lot of different summer camps around the city. From the minute I picked him up until we got home he couldn’t stop talking about everything he had done at camp that day and what he was looking forward to doing the next day. The week flew by because he was so engaged in the program, had made some friends, liked the staff and felt like a valuable team member. I know without a doubt that he will want to return next summer and I can’t wait until my daughter is old enough to join him as well. Keep up the great work! "One Of The Best Experiences I've Ever Had"
In the words of my 10-year-old son: ‘It was so cool! I got to build robots that could play soccer and stack blocks, and it was one of the best experiences I’ve ever had in my lifetime! I made lots of new friends AND I also had fun playing Ultimate Frisbee. The leaders were lots of fun, too.’ As a parent, I was glad to be able to offer my son the Bot Camp experience. Thanks, Bot Camp leaders, for your passion, dedication, and care. "The Highlight Of My Vacation"
What a thrilling experience it was. I enjoyed discussing with my mentor about building options and game strategies as we were preparing for the challenges. The staff that organized the camp were teachers and mentors from some of the greatest Robotics teams in Toronto. Looking back at my summer, I will say that this camp was the highlight of my vacation. "The Way School Should Be"
This is the way school should be. Fun! I like the program because it is fun to build robots and have contests and play Ultimate Frisbee. I also like how all the instructors had fun and were all friendly. Thank you for the great week. We started Bot Camp in 2014 with a simple goal in mind: to create the perfect robotics program - one that I would send my own kids to. It would be modelled around our “ideal” sports camp. Imagine a hockey camp where students could spent a week with an elite NHL player, like Sidney Crosby, in a 4 to 1 ratio. Each day would be a personalized mentoring experience spent learning skills, techniques, strategies, and tips and tricks from an elite athlete first-hand. The ability to interact face-to-face, to watch and learn, to ask any question and get every answer at any moment in time – all from the most skilled and accomplished individuals at their craft. That was the dream summer camp. Bot Camp is our attempt at realizing this dream. Students work in a 4 to 1 ratio with our award-winning competitive roboticists in a week-long summer program where they design, build, program and pilot robots to compete in a series of robotics sports tournaments. Our personalized approach allows us to tailor instruction to different skill and experience levels. If you have never built a robot before, our instructors will ensure you are taught everything you need to build your very first robot. If you are an experienced roboticist, our instructors will work with you to improve the functionality of your robots, pushing you to your limits. This is the program I wish I had as a child, and am thrilled to be able to share it with you. Shawn is a former robotics teacher at Crescent School, winners of the 2013 FIRST Robotics Competition (FRC) World Championships. He was a founding member of FRC team 188, the very first Canadian high-school competitive FRC robotics team. 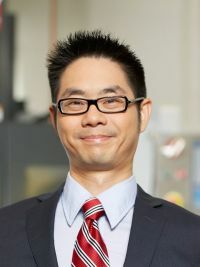 He attended university at General Motors Institute on the first-ever robotics scholarship awarded to a Canadian student. He served on the Board of Directors of FIRST Robotics Canada for 8 years, and as Director of District Implementation. Most recently, he taught at St. Clement's School, delivering robotics and computer science programming specifically for girls. He has been an active participant, mentor and leader in the educational robotics community for over 22 years. This was an incredible awards haul by SK Creations. 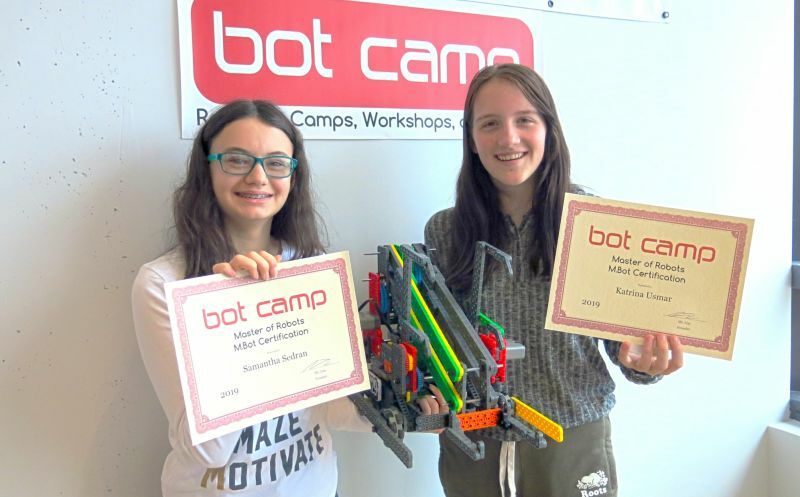 We are extremely proud to call Samantha and Katrina Bot Camp alumni, but we can't say we're surprised one bit. They are awesome! The best part is SK Creations wants to share their success and robotics experiences with as many girls as possible. The reality is even in 2018, girls are often discouraged from pursuing STEM-related actitivities and careers. To counteract this, SK Creations has launched their "16 by 16" campaign to send 16 girls to robotics camp before Samantha and Katrina turn 16 years old. Promoting girls in STEM is something Bot Camp feels passionate about too. We think we have some of the best robotics programs for girls to participate in, and go out of our way to make that happen. Our instructors are incredible role models, including Andrea Valenzuela, the newly promoted Camp Director of our St. Michael's Campus, who is pictured above with Samantha and Katrina. We want as many girls as possible to experience Bot Camp, and have committed $800 of in-kind robotics camps towards their campaign. Interested in Bot Camp – Specialty Robotics Programs?